Addictions have increased markedly in contemporary societies over the past decades. As well as widely acknowledged issues surrounding illegal substance addictions, there are increasing numbers of problems related to behavioural addictions such as the use of legal substances such as antidepressants and amphetamines. These addictions are concerning for a range of public policy fields, not least, public health and social cohesion. As a result, cohesive governance of addictive substances and behaviours is paramount to future public policy.This book is based on the findings of a five year, multidisciplinary project (Addictions and Lifestyles in Contemporary Europe - Reframing Addictions Project) studying the pace and impact of addictions in Europe, and is the concluding volume in the Governance of Addictive Substances and Behaviours series. 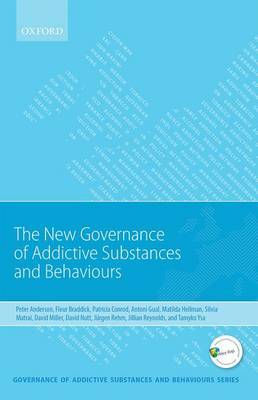 Authored by 11 leading figures in the fields of public health, psychology, sociology, psychiatry, addiction studies, epidemiology, and social and public policy, the book takes a truly comprehensive approach to the study of the current state of addiction governance in Europe and proposals for a future governance framework.No one country has yet got governance polices right. The project's outcome is a plan for the redesign of addictions governance, which includes amendments to key metrics used in research, promoting individual-level to society-level scope of understanding in policy approaches, and bringing the impact of dependency on societal well-being to the fore.New Governance of Addictive Substances and Behaviours is an unprecedented study, both in terms of international reach and scope of issues addressed. It will be a key resource for anyone with an interest in research-driven European policy change in public health and the field of addictive substances and behaviours.